In April, while sitting on the balcony you have a front row view of the Rolex Regatta. SB has a bi-level pool and two beaches. The beach for snorkeling in front of the Condo has a reef to the right and a grassy haven to the left where turtles love to feed. Dive/snorkel gear is available at the dive shop. Sapphire's Marina has parasail, jet ski rentals, sailing and fishing charters. Red Hook is 1 mile away by car or taxi, has night life, Ferry service to other islands and where American Yacht harbor is located. I have great referrals/contacts for restaurants, a personal trainer, private charters, jewelry stores and excursions as I spend a lot of time on the island and have many local friends and contacts. 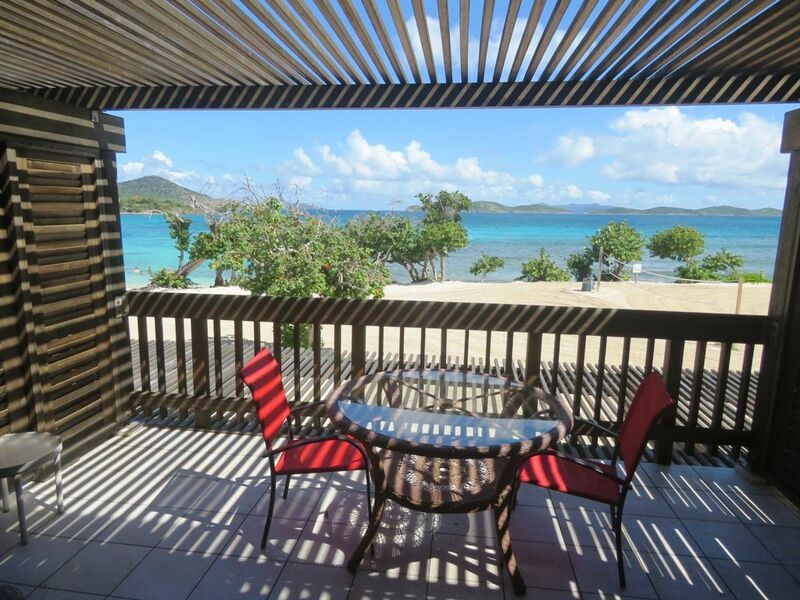 SBRM is 12 miles from Cyril E. King Airport at the east of St. Thomas overlooking St. John. It is 6 miles from Charlotte Amalie (the shopping capital of the Caribbean), the cruise terminal, Havensight Mall, Atlantis Submarine Adventures and the Skyride to Paradise where you can view other islands from the top of St. Thomas. It is 2 miles from Coral World Marine Park . For the golfer who thinks they have played it all, you are 4 miles from Mahogany Run 6,022 yard, par 70 ,18 hole course designed by Tom Fazio which offers the most beautiful holes in the Caribbean, the spectacular 'Devil's Triangle', 13th, 14th and 15th hole on the Atlantic Ocean. 6 miles from Megan's Bay for those who don't want to play golf. SBMR is 1 mile to Red Hook where you can catch a ferry to St. John, Tortola, Virgin Gorda and Jost Van Dyke or local island shopping. Fully furnished bathroom with tub shower combination and double sinks. The resort supplies provide free WIFI thru ADM Wireless. Password is "rutgers1"
We provide cleaning supplies, toilet paper, paper towels, garbage bags, etc. Fully furnished kitchen with refrigerator, stove, microwave. no dishwasher or garbage disposal. Furnished with most small appliances you will need for a week long stay like blender, coffee pot, etc. nice landscaping throughout the resort with some grass and lots of sidewalks to the various area. We also have a marina at this resort. Each condo has its own balcony overlooking the ocean. Marina is part of this resort with several options for renting boats, daysail charters, catamaran trips to the BVI, jetski's, sailing options. Plenty to choose from. Nearby Mahogany Run golf coarse with famous 18th hole overlooking the ocean. Only about a twenty minute drive. We are located on the second floor of Building B with one set of stairs. Not easy for wheelchair access. Large two level pool overlooking the ocean on the point. Pros: Initially room seemed nice. Loved the view, located beach front property. Sleeping was comfortable with king bed and sofa bed. Full kitchen with stove, fridge and microwave. Well stocked with towels. Cons: roaches in the room, plumbing issues with toilet and faucets in tub. Not well stocked with toilet paper. Lights was out in bedroom and hallway. Only one lights worked in entire room. The managers were responsive and tried to assist promptly. Having stayed at Sapphire several years ago, we pretty much knew what to expect from the grounds and beach, which are still very beautiful and convenient. This unit on the second floor in the B-building is well-furnished and worth what we paid. I'm sure there are more expensive units with more recent renovations and nicer furniture, etc, but this one is functional and tidy enough. The balcony overlooks the volleyball area but still has a nice view of the ocean. Property managers were easy to deal with. Checking in and leaving were very easy, and they were kind to let us check out late. Other pros: near Red Hook, free beach chairs during the day, beach bar and beach rentals on property, great snorkeling right outside, sleeper sofa, tons of clean linens and towels (they even smelled good! ), good water pressure in the shower, AC that works fairly well, easy parking, plenty of kitchen supplies, and has sand toys to borrow. Cons: beach gets very crowded on cruise ships days (but just camp out to the right side of the beach near the point and you'll be fine), area around pool is (always!!) under construction, pool area has no lights at night, no good place to hang several wet beach towels in the condo (the balcony gets wet if it rains), dusty/dirty in kitchen drawers/cabinets, king bed is not super comfortable, no cooler to borrow and take to the beach, and the slatted bathroom door allows little privacy (but I think most of the units have this too). Also, we wish there had been some fold-up beach chairs that we could borrow and take with us to other beaches. In 6+ visits to the islands, we've never stayed somewhere that lacked this amenity. That said, we would likely stay here again if we were traveling again on the same budget. We recommend: paying attention to the cruise ship schedule and planning accordingly, going to Megan's on a no-cruise day, eating at Duffy's, taking the ferry to St John and going to Cinnamon and/or Trunk, snorkeling at Maho at dusk to see turtles, bringing bug spray, using reef-safe sunscreen, buying bottled water and ice, BYO cooler, packing frozen foods (we always freeze and bring lunchmeat, cheese, a porkloin or whatnot, and condiments) if you don't want to eat out every night, renting a Jeep (we used Amalie Car Rental and they were EXCELLENT, plus their vehicles are allowed to go to St. John), and drinking lots of rum. :) Oh, and check out Coki for good people-watching. This is, by far, the best beach on St. Thomas. Right around the corner from Red Hook's bars and restaurants, there is so much to do. The ferry also leaves from Red Hook making a St John adventure very easy. I would highly recommend staying here if you are looking for a relaxed, quiet beach to unwind and get away from reality! Spacious condo with beautiful view. We loved the view. That was the main draw. The condo was spacious for two. Furnishings and design were average. AC did not always function. The water pressure was low and water temp was hard to control in bathtub. On island contact was courteous. Felt that paper supplies like toilet paper and Kleenex should have been readily available instead of having to call for them and receive them the next day. (You need it when you need it). Also we are sports fans and would have enjoyed cable TV to keep up on the games. We stayed over the Christmas holidays. The apartment had a few teething troubles but I think that was due to a new owner / agent relationship. The problems were resolved by the agent promptly despite it being the holiday so I think the ability to resolve issues is more important than the problem themselves. The apartment had one large room with large bed, a pull out sofa and we asked for a inflatable bed. For 5 is is cozy but manageable. The location is excellent looking over Sapphire beach. The beach can get a little busy on Cruise Ship Days (tue/wed?) but nothing that would worry you too much. Beach chairs are available as were multiple snorkel sets and there is a volleyball court (with free volleyball usage). The pool is rarely mentioned but is very good and little used. The pool refreshment bar is under renovations but the apartment is 100 yards away and a beach bar is 200 yards. The complex is 1 mile from Red Hook which has plenty of bars/restaurants and food. There are buses going into town ($1) but they only travel clockwise around the island so you need taxi ($5/person) to get back. Walking to town is just possible but there is a tricky section (up hill coming back) without sidewalks so not for kids or at night. We rented a car but you could probably get by without one and pay for the taxis (remember it is a per person rate). There is a supermarket in Red Hook (Moe's) and another just outside so no need to worry about getting supplies. The drive to the airport was about 25 minutes. We did a day trip to St John - the ferries are in Red Hook so very close - we booked in advance but it seems to be first come first served irrespective. I booked this unit for my parents vacation the first week in April. They had a wonderful time & were very happy with everything about this property. The condo is very well maintained, clean & has a great tropical decor. The balcony looks directly out over the beach~ wonderful views! Sapphire Beach is a wonderful place to stay! It was pleasure communicating & booking this property with the owner- Lisa. Thank you for sharing your property with my family!